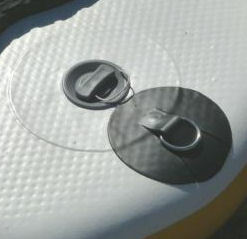 All good quality i-SUP boards are constructed with thousands of threads holding the top deck to the bottom of the hull . 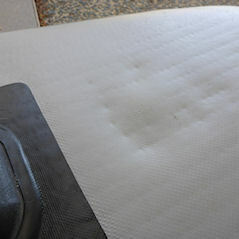 The more threads a board has (more dimples and higher thread count) the better the quality of the board. These threads help keep the original board shape true to the original board shapers design, they can produce rocker lines and concaves within the original design concept, so they are very important to the board. The inflation valve can be placed at the front or rear of the board depending on the original design concept. The valve is an integral part of the board with an internal cup section and this is the only place that there are no stitches. The stitches give the board surface a uniformly flat surface to the skin apart from the small dimples where the stitches are located. 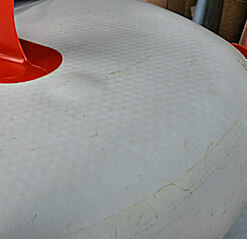 The only place on the board where it is not possible to have the internal stitches is where the inflation valve is situated. Opposite to the inflation valve (on the underside of the board) you will notice a small bump, this is quite normal as there are no stitches holding the under side surface flat. the higher the thread count, the more pronounced the under side bump will be. Some board designs can cover up the bump by placing a fin where the bump is situated so it is not visible but this is not always possible without compromising the performance of the board. To summarise, if your board has a bump on the underside opposite the valve, this is not a defect, it is part of the board construction.